Sunrisers Hyderabad should’ve romped home on a canter, but an epic choke in the last five overs resulted in Delhi Capitals securing their third consecutive win of the season. However, the biggest consolation for the team should be the way Khaleel Ahmed applied himself on a rather sticky wicket. David Warner (5/10): The way Warner started, it seemed like the innings had considerable substance until the moment, he decided to mess things up. After Bairstow and Kane Williamson’s dismissal, the Aussie was the man for the situation, but he choked under pressure to end SRH’s dream of getting back to winning ways. Jonny Bairstow (7/10): SRH knew that Jonny Bairstow is a temporary operator in the Indian Premier League and once he goes back to England, as his team will prepare to take on Pakistan, they will have to bring in either of Sreevats Goswami or Wriddhiman Saha to open with Warner. Bairstow was allowed to express himself and played a fine innings of 40 runs to establish a brilliant opening partnership. Kane Williamson (5/10): Not the kind comeback that Williamson would’ve fantasized. After Bairstow and Warner set up a template, Williamson needed to have composure because the asking rate was still within eight. By playing a risky drive, he not only let himself down but also added a lot of pressure on a fresh-look middle order. His bowling changes, however, were so good that it forces me to elevate his points to 5. Ricky Bhui (1/10): First he denied a single, then he was given a life, and then he was given another life. Ricky Bhui had been served chances on a platter to leave an indelible mark tonight, but, it seems, he wasn’t interested in any of them. After all the lives, he ended up with seven runs off 12 balls. Certainly not expected from someone who has scored a hell lot of runs on the domestic circuit. Vijay Shankar (1/10): Well, this has become a very capricious situation for the Indian selectors now. At a time when the No.4 spot in the Indian team for the World Cup seems to be up for grabs, Vijay Shankar played an absolutely unnecessary innings to be dismissed for 1, which resulted in a heart-breaking loss for the team. Deepak Hooda (1/10): He has been nick-named “Hurricane” for his ability to change the direction of games single-handedly. Deepak Hooda did little to live up to the reputation. When a bit of patient batting would’ve made him a hero tonight, he chose not to be careful and in the process, let the Chris Morris delivery crash into his stumps. This sums up his IPL career in a way as well. Rashid Khan (6.5/10): If you are conceding just three runs and picking up a wicket in the 18th over of the innings, with a hard-hitting batsman on strike, then you have done something good for sure. The leg-spinner was gripping the ball nicely and that didn’t allow Delhi Capitals players to open their arms, making batting look more difficult than it actually was. Abhishek Sharma (6/10):Colin Munro and Abhishek Sharma had spent a lot of time together at Delhi Daredevils (now Capitals) camp last year and when the latter dismissed the Kiwi for his first IPL wicket, it was understandable that Sharma had taken note of his batting last year. His batting, however, was not upto the mark in the game and was dismissed for a couple. Bhuvneshwar Kumar (7.5/10): On a day he became the first player to pick 100 wickets for SRH, Bhuvneshwar Kumar brought his A game to the fore. 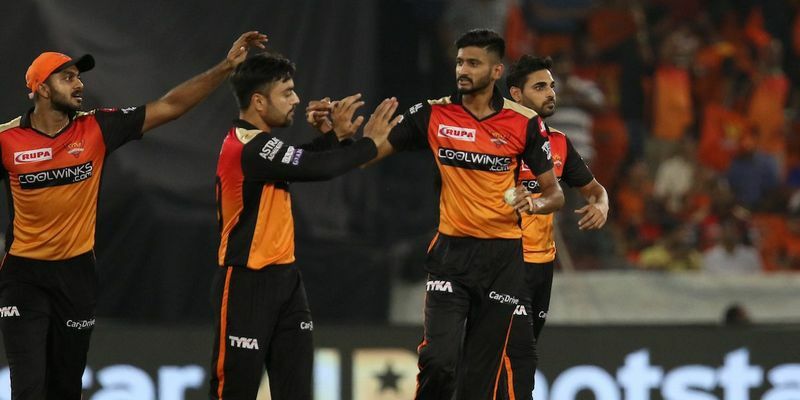 Even though he failed with the new ball, by restricting the run-flow towards the end, the SRH vice-captain ensured the team had a comparatively lesser target to chase than what it should have been in a normal scenario. Sandeep Sharma (4/10): A graphic by the host broadcaster showed that Sandeep Sharma takes 70% of his wickets on slower balls and 30% of balls on stock delivery. If Sandeep was aware of that, then only he could explain why he was landing with full throttle and not letting the slower balls coming out of his hands more frequently. Khaleel Ahmed(8/10): In an interview today, Khaleel Ahmed tried to prove a point by saying India need his services at the World Cup, especially because his left-handedness will help the team big-time. He proved a point on his SRH return by sending three Delhi players back to the pavilion. A solid comeback to the team and also might be sufficient enough for the selectors to have him back in the squad.